Niccolò Piccinino (1386 – 15 October 1444) was an Italian condottiero. He was born at Perugia, was the son of a butcher. After an outstanding victory over the Venetians at the battle of Delebio (19 November 1432), he defeated the papal forces at Castel Bolognese (1434). When another papal army under Francesco Sforza defeated and killed Fortebraccio at Fiordimonte, Piccinino was left in sole command of the Visconti army, and in a series of campaigns against Sforza he seized a number of cities in Romagna by treachery. 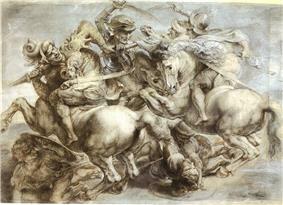 Peter Paul Rubens's copy of The Battle of Anghiari by Leonardo da Vinci. Allegedly Niccolò Piccinino is the horseman 2nd from left. In 1438, during the war between Venice and Milan, Piccinino, fighting for the duchy of Milan Filippo Maria Visconti, tried to take the city of Brescia, in Lombardy, but Scaramuccia da Forlì, fighting for Venice, intervened successfully to raise the siege. In 1439 Piccinino again fought in Lombardy with varying success against Sforza, who had now entered the Venetian service. Piccinino then induced the duke of Milan to send him to Umbria, where he hoped, like so many other condottieri, to carve out a dominion for himself. He was defeated by Sforza at the Battle of Anghiari (1440), but although a number of his men were taken prisoners they were at once liberated, as was usually done in wars waged by soldiers of fortune. 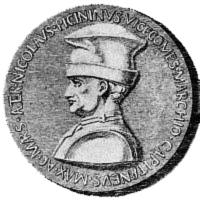 Again the war shifted to Lombardy, and Piccinino, having defeated and surrounded Sforza at Martinengo, demanded of the visconti the lordship of Piacenza as the price of Sforza's capture.